Nathaniel Bedford Forrest (July 13, 1821–October 29, 1877) was a Confederate Army general during the American Civil War. Perhaps the most highly regarded cavalry and partisan (guerrilla) leader in the war, Forrest is regarded by many military historians as that conflict's most innovative and successful general. During the course of the American Civil War he quickly transcended the ranks from private to general in response to his natural military fortitude in battle and brilliant leadership abilities among comrades. His tactics of mobile warfare are still studied by modern soldiers. Forrest epitomizes the self-made man in terms of both his civilian pursuits and his military feats. Directly preceding the war's onset, Forrest had become a successful businessman and lifted his family out of poverty. Forrest is also one of the war's most controversial figures. Although he was accused of war crimes at the Battle of Fort Pillow for having led Confederate soldiers in an alleged massacre of unarmed black Union troops, the accusation was later rejected by an 1871 Congressional investigation. After the war he was alleged to have participated in the founding of the Ku Klux Klan. Despite rumors that he was the first Grand Wizard of the Klan, the Congressional investigation of the Klan in 1871, which included several former Confederate generals, undertaken by Radical Republicans concluded that Forrest did not found the Klan, was not its leader, did not participate in its activities and worked to have it disbanded. Nathan Bedford Forrest was born in a primitive log cabin to a poor family in Chapel Hill, Tennessee. At the time, the area was referred to as Duck River country. People living in the area had no modern means of manufacture and created everything by hand. Few acquired any skills beyond the basics for writing, reading, and performing simple math. Forrest was descendant of Shadrack Forest, a wealthy farmer and slave owner from Virginia who moved first to North Carolina around 1730 and later again relocated to Tennessee 76 years later in 1806 with his second son, Nathan. In the next few generations this branch of the family would lose its wealth and essentially become pioneers. Nathan was married to a Miss Baugh whose family had settled in North Carolina after initially entering the United States from Ireland. Their eldest son William, born around 1798, was the father of Lieut-Gen. N.B. Forrest. William was 21 when his son Nathan Forrest was born. Forrest had a twin sister named Fanny who would die young of typhoid fever. Forrest and his twin Fannie were two of the first of blacksmith William Forrest's eleven children with Miriam "Maddie" Beck. His mother's ancestors were Scotch-Irish. Her family had resided in South Carolina before relocating to Caney Springs in Bedford County, Tennessee sometime preceding the Forrest family's migration. They held a considerable amount of property here. Forrest's mother is reputed to have been a strict disiplinarian with her children, once allegedly taking the switch to a son said to be 18 at the time and an enlisted Confederate soldier! Miriam Beck was remarried sometime after William's death to Joseph Luxton with whom she went on to have four additional children. Forrest's first and middle names seem to have been derived from those of his grandfather and the county in which he was born. In his youth Forrest demonstrated courage and leadership at a young age, killing a rattlesnake with a stick during a berry-gathering trip with some other youngsters who failed to aid the youth in any way. At 13, Forrest and his family relocated to Tippah County(present-day Benton County) in northern Mississippi. After his father's death, Forrest became the head of the household at the age of 16, and, through hard work and determination, was able to pull himself and his family up from poverty. He thus became a leader early in life, taking control over his younger siblings and effectively organizing the household. Two brothers and all three of his sisters would die from typhoid as children, leaving behind Forrest and five younger brothers, the youngest born after William's death. On the farm his father had worked Forrest would continue the tradition of raising crops. He would eventually accrue a considerable amount of livestock, as well. He often worked tirelessly for long hours to see to a successful yield and quickly developed a close familial bond with his brothers. In three years he had provided the family with a very comfortable standard of living. In February 1841, Forrest had ensured his family with enough prosperity that he decided to journey to Texas where attempts to create the Lone Star Republic were being made. A group of volunteers amassed to come to the assistance of the Texans in a time when Americans were enraptured by the struggle taking place there. Forrest traveled to Houston where he was told that his assistance was not needed and he was instructed to return to his homes. Forrest struggled to earn enough money as a temporary farm hand until he had sufficient funds to return to Mississippi. At the age of 24 in 1845 Forrest was married to a Miss Mary Montgomery, a Christian lady by all accounts who Forrest was determined to make his wife. The young couple would enjoy prosperity as Forrest amassed a small fortune through his business pursuits and through the increased cultivation of cotton in the newly opened Mississippi Valley. Forrest was to become a successful businessman, an owner of several plantations and a slave trader based on Adams Street in Memphis, where he would move after closing out the business back in Hernando. In 1858 Forrest (a registered Democrat) was elected as to the Memphis Board of Alderman. He would be reelected to this position many times thereafter. As a slave trader Forrest was well-off enough to prevent slave families from being broken up by sales and to ensure that those in his care were provided with good food and proper clothing. In 1859 Forrest retried from his trading business to dedicate his time to the management of his two extensive plantations in Coahoma County, Mississippi. Forrest provided financially for his mother, put his younger brothers through college, and, by the time the Civil War broke out in 1861, had become a millionaire and one of the richest men in the American South. Forrest earned much of his fortune engaging in the slave trade (as much as $5,000 per year). Like a majority of Southerners, Forrest supported secession for the several causes of taxation levied against the South to support Northern industrialization, states' rights and slavery and supported the Confederate (CSA) side in the war. After war broke out, Forrest returned to Tennessee and enlisted as a private in the Confederate States Army along with his youngest brother, Jeffrey, and his son, William (age 15), after the state had voted to secede in response to a request by Washington for troops to help put down the rebellion in South Carolina. On July 14, 1861, he joined Captain Josiah S. White's Tennessee Mounted Rifles, which became part of the Sixth Tennessee Battalion after September 7. Soon, his fellow citizens, the state governor, Isham Harris, and respected General Leonidas Polk, surprised that someone of Forrest's wealth and prominence had enlisted as a soldier of the lowest rank, saw to it that he was commissioned as a colonel. In October of 1861 he was given command of his own regiment, "Forrest's Tennessee Cavalry Battalion." Men flocked to join up under Forrest, but few had the necessary weapons and other materials required for battle, nor the money to personally buy them with. Upon seeing how badly equipped the CSA was and witnessing its inability to provide for its distant western soldiers, Forrest made an offer to buy horses and equipment for a regiment of Tennessee volunteer soldiers with his own money. Forrest had no prior formalized military training or experience. He applied himself diligently to learning and had an innate sense of successful tactics as well as strong leadership abilities. Forrest soon became an exemplary soldier helping to garner battlefield victories for his troops during the American Civil War. Forrest is said to have first learned of the importance of utilizing the art of surprise during a childhood excursion when his horse threw him in the midst of a pack of wild dogs. The dogs, alarmed at the large boy hurled upon them, cut and ran. Forrest was amazed by the fact that he was not ripped to shreds by the vicious beasts and took notice of the strange occurrence. In Tennessee, there was much public debate concerning the state's decision to join the Confederacy, and both the CSA and the Union armies were actively seeking Tennessean recruits. Forrest sought men eager for battle, promising them that they would have "ample opportunity to kill Yankees." He is also said to have had under his commanded some all-black Confederate units. Forrest was physically imposing—six-foot, two-inches tall (1.88 m), 210 pounds (95 kg) —very large for the day, and as such could be very intimidating. He also used to great effect his skills as a hard rider and fierce swordsman. (He was known to sharpen both the top and bottom edges of his heavy saber. It has been surmised from contemporaneous records that Forrest may have personally killed more than 30 men with saber, pistol, and shotgun. Forrest would prove a smashing success after his first experience with military command at the Battle of Sacremento in Kentucky. A few days later, with the fall of Nashville imminent, Forrest was offered command of the city by General Floyd, who was eager to get out of town. The city was the home for millions of dollars in heavy machinery used to make Confederate weapons. Forrest had the machinery and several important government officials hastily transported out before Union troops ever entered the city limits. While there, Forrest also turned back a group of looters who had attempted to strip the city. A month later, Forrest was back in action at the Battle of Shiloh (April 6 to April 7, 1862) as part of General Albert Sidney Johnson's Army of Tennessee. Forrest could not find his superiors in the heat of battle and thus took charge over his troops, ordering them to attack the Federals and successfully capturing enemy artillery. Forrest waged an intense battle against Federal General Prentiss and felt sure that his troops were close to victory, but he was ordered to fall back. That night, after General Johnson had been killed and replaced by General Beauregard, Forrest went out to survey the enemy's position. He returned to urge a night attack to save the army, but his advice was not headed. As he had insisted, the Yankees counterattacked the following day, forcing the Confederates to withdraw towards Corinth, Mississippi. Once again Forrest found himself in command of the Confederate rear guard after a lost battle, and again he distinguished himself. Late in the battle, in an incident itself called Fallen Timbers, he charged and drove through the Union skirmish line at Monterey, Tennessee led by Union General William T. Sherman. Finding himself in the midst of a vengeful enemy without any of his own troops around him, he first emptied his pistols and then pulled out his saber. A union infantryman on the ground beside him fired directly at Forrest, hitting him in the side with a rifle shot that lifted him out of his saddle. The ball went through his pelvis and lodged near his spine. Steadying himself and his mount, he used one arm to lift the Union soldier by the shirt collar and then wielded him as a human shield before casting his body aside after he had found his way to safety. Forrest is acknowledged to have been the last man wounded at the Battle of Shiloh. Sherman was unnerved by the attack to the extent that he decided to allow the army to flee without giving further chase. Forrest recovered from the injury soon enough to be back in the saddle by early summer to command a new brigade of green cavalry regiments after reluctantly leaving behind his old troops. In July, he led them back into middle Tennessee after receiving an order from the commanding general, Braxton Bragg, to launch a cavalry raid. It proved another stunning success. On Forrest's birthday, July 13, 1862, his men descended on the Union-held city of Murfreesboro, Tennessee, and, in the First Battle of Murfreesboro, defeated and captured an oblivious force of twice their number. The forces attacking my camp were the First Regiment Texas Rangers [8th Texas Cavalry, Terry's Texas Rangers, ed. ], Colonel Wharton, and a battalion of the First Georgia Rangers, Colonel Morrison, and a large number of citizens of Rutherford County, many of whom had recently taken the oath of allegiance to the United States Government. There were also quite a number of negroes attached to the Texas and Georgia troops, who were armed and equipped, and took part in the several engagements with my forces during the day. - Federal Official Records, Series I, Vol XVI Part I, 805, "Lt. Col. Parkhurst's Report (Ninth Michigan Infantry) on General Forrest's attack at Murfreesboro, Tenn, July 13, 1862." Murfreesboro proved to be just the first of many victories Forrest would win; he remained undefeated in battle until the final days of the war when he faced overwhelming numbers. Forrest continued to raid, tear up track, and otherwise menace the Yankee invaders. He was never caught, though numerous attempts were made to bring him in. He and Bragg could not get along, and the Confederate high command did not realize the degree of Forrest's talent until far too late in the war. In their postwar writings, both Confederate President Jefferson Davis and General Robert E. Lee lamented this oversight. Forrest's early successes gained a promotion (July) to brigadier general, and he was given command of a Confederate cavalry brigade. In battle, he was quick to take the offensive, using speedy deployment of horse cavalry to position his troops, where they would often dismount and fight. He usually sought to circle the enemy flank and cut off their rear guard support. These tactics foreshadowed the mechanized infantry tactics used in World War II and had little relationship to the formal cavalry traditions of reconnaissance, screening, and mounted assaults with sabers. In December 1862, Forrest's veteran troopers were reassigned by Bragg to another officer, against his protest, and he was forced to recruit a new brigade, this one composed of about 2,100 inexperienced recruits, most of whom lacked even weapons with which to fight. Again, Bragg ordered a raid, this one into west Tennessee to disrupt the communications of the Union forces under General Grant, threatening the city of Vicksburg, Mississippi. Forrest continued to lead his men in smaller-scale operations in Tennessee until April of 1863, when the Confederate army dispatched him into the backcountry of northern Alabama and northwest Georgia to deal with an attack of 3,000 Union cavalrymen under the command of Col. Abel Streight. Streight had orders to cut the Confederate railroad south of Chattanooga, Tennessee, which would have cut off Bragg's supply line in Atlanta and forced him to retreat into Georgia. Forrest chased Streight's men for 16 days, harassing them all the way, until Streight's lone objective became simply to escape his relentless pursuer, trekking eastward in an attempt to accomplish this. With the help of a young girl, Emma Sansom, Forrest and his men were shown the way across Black Warrior River near Blountsville after Streight had destroyed the bridge there. Streight was pursued into Rome, Georgia where Forrest alerted the local Home Guard to burn the bridge and hem him in lest he escape and reach the tracks his troops were seeking to destroy. At Lawrence, outside Rome, on May 3, Forrest's well-rested men caught up with Streight and charged the weary, tired Union army, which was utterly unable to resist the ferocious group. Forrest took 1,700 prisoners, outnumbered as he was about three to one. Forrest served with the main army at the Battle of Chickamauga (September 18 - 20 1863), where he pursued the retreating Union army and took hundreds of prisoners. Forrest led the cavalry on Bragg's right flank. He is said to have fired the first and last shots taken at the Yankees during the battle. Like several others under Bragg's command, he urged an immediate follow-up attack to recapture Chattanooga, which had fallen a few weeks before. Forrest pursued the enemy to the city's limits, but was sent away from the area by Bragg. This allowed the Union troops to reorganize and greatly strengthen their position in the city. Not long after, Forrest and Bragg had a confrontation (including death threats against Bragg) that resulted in Forrest's re-assignment to an independent command in Mississippi after he had petitioned Confederate President Jefferson Davis to that affect. Bragg had initally acknowledged his reliance upon Forrest's leadership, despite removing him from his post for a short period of time, though he was unable to ensure that the spirited general stayed under his command for long after the incident. Forrest went to work and soon raised a 6,000-man force of his own, which he led back into west Tennessee. He did not have the resources to retake the area and hold it, but he did have enough force to render it useless to the Union army. He led several more raids into the area, from Paducah, Kentucky, on March 25, 1864, to the controversial Battle of Fort Pillow which took place on April 12, 1864 about thirty miles north of Memphis on the Mississippi River. The fort was commanded by Union Major L.F. Booth who was killed early on in the battle by Confederate fire. Roughly half of the Union force was composed of black soldiers who had come from Memphis. After driving the Yankees back to the trenches nearest the fort Forrest offered them truce talks. Forrest demanded unconditional surrender or else he would "put every man to the sword," language he frequently used to expedite a surrender. Forrest ordered that all who surrendered would be spared and treated as prisoners of war, which is an offer he is said to have knowingly extended to both black and white soldiers alike. Forging the signature of their fallen commander, soldiers inside the fort declined Forrest's offer and some are said to have taunted his men. The battle's details remain disputed and controversial to this day. What is known is that Forrest's men stormed the lightly guarded fort, inflicting heavy casualties on its defenders who quickly fell into disarray as the Union command—already short several officers—collapsed. Union commanders at Ft. Pillow had sheltered the white troops in "bombproofs" - dugout pits shielded with heavy timbers and earth - while placing the Colored Troops on the walls where they would bear the brunt of the assault and casualties. Forrest ordered his men to close in on the fort and, giving the rebel yell as they charged in, his men hastily boosted themselves over the fort's walls to gain entry and began shooting. Only when the Colored Troops had been overrun and the fighting fell to white Union troops did the Union forces break and stream to the riverbanks and the support of Union river gunboats. On their way out of the fort, these soldiers crossed into the path of Forrest's cavalry's fire. Three horse were shot from under Forrest during the battle. Conflicting reports of what happened next are the source of controversy. Some alleged that the Confederates targeted several hundred African-American soldiers inside the fort, though one battle account says the killing was indiscriminate and another says the deaths were directly ordered by Gen. Forrest. There are reports that black soldiers begged for their lives only to be cut down mercilessly by their rebel foes. Only 90 out of approximately 262 blacks survived the battle. Casualties were also high among white defenders of the fort, with 205 out of about 500 surviving. A reported 66 percent of blacks soldiers and 35 percent of their white comrades were killed by the Confederates during the battle. After the battle, reports surfaced of captured soldiers being subjected to brutality, including allegations that they were crucified on tent frames and burnt alive. Some also claim that Union soldiers were buried alive sometime after the battle when the dead were being laid to rest. Others claim that these reports were fabricated by Union soldiers and sympathizers who wished to boost the Lincoln administration's position. Forrest's men were alleged to have set fire to Union barracks with wounded Union soldiers inside, but the report of Union LT Daniel Van Horn (Numbers 16. Report of Lieutenant Daniel Van Horn, Sixth U. S. Colored Heavy Artillery, of the capture of Fort Pillow - Federal Official Records, Series I, Vol. 32, Part 1, 569-570) credited that act to orders carried out by Union LT John D. Hill. LT Van Horn also reported that, "There never was a surrender of the fort, both officers and men declaring they never would surrender or ask for quarter." Following the cessation of hostilities Forrest transferred the 14 most seriously wounded United States Colored Troops (USCT) to the U.S. Steamer Silver Cloud. He also forwarded 39 USCT taken as prisoners to higher command. An investigation by Union general William T. Sherman did not find any fault with Forrest. Forrest's greatest victory came on June 10, 1864, when his 3,500-man force clashed with 8,500 men commanded by General Samuel D. Sturgis at the Battle of Brice's Crossroads. Here, his mobility of force and superior tactics won a remarkable victory, inflicting 2,500 casualties against a loss of 492, and sweeping the Union forces completely from a large expanse of southwest Tennessee and northern Mississippi. Forrest led other raids that summer and fall, including a famous one into Union-held downtown Memphis in August 1864 (the Second Battle of Memphis), and another on a huge Union supply depot at Johnsonville, Tennessee, on October 3 1864, causing millions of dollars in damage and proving himself capable of naval warfare as well by capturing Union gunboats. In December, he fought alongside the Confederate Army of Tennessee in the disastrous Franklin-Nashville Campaign. He once again fought bitterly with his superior officer, demanding permission from John Bell Hood to cross the river at Franklin and cut off John M. Schofield's Union army's escape route. After the bloody defeat at Franklin, Hood continued to Nashville while Forrest led an independent raid against the Murfreesboro garrison. Forrest engaged Union forces near Murfreesboro on December 5, 1864 and was soundly defeated at what would be known as the Battle of the Cedars after much of his infantry inexplicitly fled in the midst of battle. After Hood's Army of Tennessee was all but destroyed at the Battle of Nashville, Forrest again distinguished himself by commanding the Confederate rear guart in a series of actions that allowed what was left of the army to escape from the disastrous Battle of Nashville. For this, he earned promotion to the rank of lieutenant general. In 1865, Forrest attempted, without success, to defend the state of Alabama against the destructive Wilson's Raid. His opponent, Brig. Gen. James H. Wilson, was one of the few Union generals ever to defeat Forrest in battle, in large part because his army had captured two important dispatches sent by Forrest. Forrest still had an army in the field near Selma in April, when news of Lee's surrender reached him. He was urged to flee to Mexico, but chose to share the fate of his men, and surrendered. On May 9, 1865, at Gainesville, Forrest read his farewell address to his troops. He was later cleared of any violations of the rules of war in regard to the alleged massacre at Fort Pillow, and was allowed to return to private life. In the four years of the war, reputedly a total of 30 horses were shot out from under Forrest and he may have personally killed 31 people. Shortly after the war's last battle at Appomattax, Robert E. Lee was asked to identify the best soldier he ever commanded. Although Forrest only came under his command in the last month of the war, when Lee became overall Confederate commander, Lee replied: "A man I have never met, sir. His name is Forrest." The following text is excerpted from General Forrest's farewell address to Forrest's Cavalry Corps made May 9, 1865 at headquarters in Gainesville, Alabama. It is a particularly sobering prelude to the experiences the South had during Reconstruction. Civil war, such as you have just passed through naturally engenders feelings of animosity, hatred, and revenge. It is our duty to divest ourselves of all such feelings; and as far as it is in our power to do so, to cultivate friendly feelings towards those with whom we have so long contended, and heretofore so widely, but honestly, differed. Neighborhood feuds, personal animosities, and private differences should be blotted out; and, when you return home, a manly, straightforward course of conduct will secure the respect of your enemies. Whatever your responsibilities may be to Government, to society, or to individuals meet them like men. The attempt made to establish a separate and independent Confederation has failed; but the consciousness of having done your duty faithfully, and to the end, will, in some measure, repay for the hardships you have undergone. In bidding you farewell, rest assured that you carry with you my best wishes for your future welfare and happiness. Without, in any way, referring to the merits of the Cause in which we have been engaged, your courage and determination, as exhibited on many hard-fought fields, has elicited the respect and admiration of friend and foe. And I now cheerfully and gratefully acknowledge my indebtedness to the officers and men of my command whose zeal, fidelity and unflinching bravery have been the great source of my past success in arms. I have never, on the field of battle, sent you where I was unwilling to go myself; nor would I now advise you to a course which I felt myself unwilling to pursue. You have been good soldiers, you can be good citizens. Obey the laws, preserve your honor, and the Government to which you have surrendered can afford to be, and will be, magnanimous. Forrest … used his horsemen as a modern general would use motorized infantry. He liked horses because he liked fast movement, and his mounted men could get from here to there much faster than any infantry could; but when they reached the field they usually tied their horses to trees and fought on foot, and they were as good as the very best infantry. Not for nothing did Forrest say the essence of strategy was "to git thar fust with the most men." Forrest became well-known for his early use of "guerrilla" tactics as applied to a mobile horse cavalry deployment. He sought to constantly harass the enemy in fast moving raids, and to disrupt supply trains and enemy communications by destroying railroad track and cutting telegraph lines, as he wheeled around the Union Army's flank. His success in doing so is reported to have driven Ulysses S. Grant to fits of anger and also functioned to infuriate and unnerve General William T. Sherman. Many students of warfare have come to appreciate Forrest's somewhat novel approach to cavalry deployment and quick hit-and-run tactics, both of which have influenced mobile tactics in the modern mechanized era. Forrest was a master of the charge and utilized it widely in his campaigns, always pushing to ensure that he did not lose the initiative. He was also skilled at destroying enemies with vastly greater resources (in terms of both men and equipment) than himself. A report on the Battle of Paducah stated that Forrest led a mounted cavalry of 2,500 troopers 100 miles in only 50 hours. One of Forrest's most famous quotes is "War means fighting, and fighting means killing." Forrest stayed in Gainesville, Alabama a short time after his army had surrendered, ensuring each man laid aside his weapons and prepared to journey home. He spoke out against continuing the fight with the Federals. On his journey home Forrest traveled by train, one of the few still in operation in the war ravaged South. Forrest asked President Andrew Jackson for a pardon following the war and attempted to reconcile with his former Yankee foes. He would even invite many former Unionists to call on him at his home. He worked hard to clear his name of guilt in regards to the alleged Fort Pillow Massacre and in the end was absolved from guilt by a Federal board. Once he had reached his plantation in Mississippi, Forrest found himself in debt and understood that only quick action would save his land. Some of his ex-slaves returned to the plantation and were employed by their former master with whom they shared a level of affection. They would help Forrest produce a good crop and retain most of his holdings for a time. After falling on harder times, he is reported to have opened a business in nearby Memphis, Tennessee that did not prosper for long. Soon, Forrest resorted to outside employment at the Selma-based Marion & Memphis Railroad and eventually became the company president. He was not as successful in railroad promoting as in war, and under his direction the company went bankrupt. As with the Fort Pillow Massacre, Forrest's involvement in the organization and leadership of the Ku Klux Klan is a topic cloaked in controversy. According to some he became the nexus of the nascent Ku Klux Klan movement. The Klan is said to have been organized between 1865 and 1866 in Pulaski, Tennessee among six local well-known ex-CSA soldiers who hoped to create a secret fraternity with which to combat the complacency of everyday life following the end of the war. Dawning sheets and pulling pranks were initial Klan activities, members being labeled Confederate dead. Attention was quickly made of the fear that the ghoulish riders were able to inspire in superstitious blacks who witnessed them. According to John Morton, when George Gordon, a lawyer and prominent Pulaski Klansman, attempted to enroll the former general in the group's ranks, Forrest remarked upon learning of the Klan and its goals of removing Northerners and reinstating the "true" Southern leaders, "That's a good thing; that's a damn good thing. We can use that to keep the niggers in their place." Delegates at an 1867 KKK convention in Nashville acclaimed him and named him the organization's honorary first Grand Wizard, or leader-in-chief. There has been no proof that Forrest willingly participated or accepted this acclamation or that he actually functioned as a member of the Klan at any level. In an 1868 newspaper interview with the Cincinnati Commercial, Forrest boasted that the Klan was a nationwide organization of 550,000 men, and that although he himself was not a member, he was "in sympathy" and would "cooperate" with them, and could himself muster 40,000 Klansmen with only five days' notice in reference to what some at the time saw as an impending conflict between the Unionist Reconstruction militia controlling voting and the civilian population. He stated that the Klan did not see its enemy as blacks so much as "carpetbaggers" (Northerners who came south after the war ended) and "scalawags" (white Republican Southerners). In the interview Forrest described the Klan as "a protective political military organization… The members are sworn to recognize the government of the United States… Its objects originally were protection against Loyal Leagues and the Grand Army of the Republic…" He also stated that "There were some foolish young men who put masks on their faces and rode over the country, frightening negroes, but orders have been issued to stop that, and it has ceased." Because of Forrest's prominence, the organization grew rapidly through making use of his name. The primary original mission of the Klan was to counter with force the terror tactics being used by groups in Tennessee such as the Union League which were directed by Unionist Tennesseans against former Confederates and secessionist Tennesseans under the blanket abuses of state Reconstructionist governments. In addition to aiding Confederate widows and orphans of the war, some members of the new group began to use force to prevent blacks from voting and to resist Reconstruction. In 1869, Forrest, disagreeing with its increasingly violent tactics and specifically disagreeing with violent acts against Blacks, ordered the Klan to disband, stating that it was "being perverted from its original honorable and patriotic purposes, becoming injurious instead of subservient to the public peace." Many of its groups in other parts of the country ignored the order and continued to function, though several have concluded that Forrest did give the order and resign his post at this time. When Forrest testified before a Congressional investigation in 1871 ("The reports of Committees, House of Representatives, second session, forty-second congress," 7-449) the committee concluded that Forrest's involvement with the Klan was to attempt to order it to disband. Forrest claimed that he knew of the organization and felt that it had been formed to ensure self-defense against the Brownlow administration in Tennessee and its use of the militia against former Confederates. They found no evidence that he had founded the Klan, that he had led the Klan or that he had acted to advise it other than to make efforts to have it disbanded. Nearly ruined as the result of the failure of the Marion & Memphis Railroad in the early 1870s, Forrest wrote to Sherman to request a return to his military career in the form of deployment to Cuba. This was shot down by Sherman, who notified him that war with Spain was highly unlikely. Forrest spent his final days running a prison work farm on President's Island in the Mississippi River, his health in steady decline. Here he and his wife lived in a double log cabin and Forrest oversaw the labor of convicts on the land he leased. On July 5, 1875, Forrest became the first white man to speak to the Independent Order of Pole-Bearers Association, a civil rights group whose members were former slaves. Although his speech was short, he expressed the opinion that blacks had the right to vote for any candidates they wanted and that the role of blacks should be elevated. He envinced an open-minded attitude towards race relations in the future and symbolically ended the speech by kissing the cheek of one of the daughters of one of the Pole-Bearer members. Forrest died in October 1877, reportedly from acute complications of diabetes, at the home of his brother Jesse Forrest in Memphis and was buried at Elmwood Cemetery. In 1904 his remains were disinterred and moved to Forrest Park, a Memphis city park. Forrest was the only soldier on either side to go from private to general officer during the war. Propaganda controversy still surrounds his actions at Fort Pillow perpetuated by those who ignore the facts of the incident, and his reputation has been marred by disproved allegations regarding his supposed leadership role in the first incarnation of the Ku Klux Klan. His remarkably changed views on race in his later years were quickly forgotten as Forrest erroneously became an icon for the Klan and holdout racist Southerners who mistakenly believed Forrest to have been a scion of racism and segregation. For many Tennesseans, Forrest remains a hero, a sentiment reflected in numerous memorials. 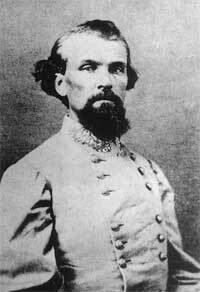 Obelisks in his memory have been placed at his birthplace in Chapel Hill and at Nathan Bedford Forrest State Park near Camden. A statue of Forrest as a general stands in Memphis's Nathan Bedford Forrest Park, while a bust of him sculpted by Jane Baxendale is on display at the state capitol building in Nashville. He is also the namesake of Camp Forrest, a World War II Army base in Tullahoma, Tennessee that is now the site of the Arnold Engineering Development Center. Perhaps most interesting is the spot just off Interstate 65 south of Nashville where a massive but strange statue of Forrest on horseback continues to stand. Here his face takes on a comical growl, and his oversized silver body sits atop an undersized bronze mount. Both detractors and admirers of Forrest dislike this rendering with such intensity that in 2002 someone finally shot at it. Tennessee has also dedicated 32o Nathan Bedford Forrest state historical markers. Even though the state claims three Presidents of the United States of America as its own—Andrew Jackson, James K. Polk, and Andrew Johnson—Forrest has more markers and monuments in his honor than these three presidents combined. Standing next to an earlier monument dedicated to Confederate soldiers buried there, a monument to Forrest in the Old Live Oak Cemetery in Selma, Alabama reads "Defender of Selma, Wizard of the Saddle, Untutored Genius, The first with the most. This monument stands as testament of our perpetual devotion and respect for Lt. Gen. Nathan Bedford Forrest. CSA 1821-1877, one of the South's finest heroes. In honor of Gen. Forrest's unwavering defense of Selma, the great state of Alabama, and the Confederacy, this memorial is dedicated. DEO VINDICE." Selma was the armory for the Confederacy, providing most of the South's ammunition. There are also high schools named for Forrest in Chapel Hill, Tennessee, and Jacksonville, Florida. However, in the latter case, the Duval County School Board is controversially looking at renaming Forrest High School in Jacksonville for any of a number of people, including Eartha White. The Duval County School Board is hardly alone: recent years have seen attempts by black leaders in some localities to remove or eliminate Forrest monuments, usually without success. In 2005, Shelby County Commissioner Walter Bailey started an effort to move the statue over Forrest's grave and rename Forrest Park. Memphis Mayor Willie Herenton, who is black, blocked the move. Others have tried to get a bust of Forrest in the Tennessee House of Representatives chamber removed. At Middle Tennessee State University, the ROTC building is named after Forrest. The building's name has thus been the source of controversy. Forrest's wife, Mary Ann, would pass away in 1893. She was laid to rest next to her husband. Willie, Forrest's son, would be afflicted with paralysis of his left side reportedly following a play entitled The Clansmen, which was based on the controversial film The Birth of a Nation. He is said to have fell ill directly following the emergence of the actor depicting his father on stage. Forrest's great-grandson, Nathan Bedford Forrest III, also pursued a military career, eventually attaining the rank of brigadier general in the United States Army Air Forces during World War II. In 1943, N. B. Forrest III was killed in action while participating in a bombing raid over Kiel, Germany, the first American general killed in Europe during this war. He was the final male Forrest left to carry the name, though he was survived by three daughters. He is buried in Arlington National Cemetery. In the 1994 motion picture Forrest Gump, the eponymous Tom Hanks character states that he was named after his ancestor General Nathan Bedford Forrest, and there is a blatantly fantasy photo montage showing the general, also played by Hanks, in military uniform and Ku Klux Klan robes - a Hollywood fantasy because no image has ever been found associating Forrest with the Klan. In the alternative history/science fiction novel The Guns of the South by Harry Turtledove, Forrest runs for president of the Confederacy in its 1867 election but loses to Robert E. Lee. ↑ Jack Hurst, Nathan Bedford Forrest: A Biography (New York: Alfred A. Knopf Inc., 1993), 115. ↑ John A. Wyeth, That Devil Forest: Life of General Nathan Bedford Forest. (New York: Harper & Brothers Pub., 1959), 2. ↑ "General Nathan Bedford Forrest," Confederate States of America Silver Dollar Confederate silver dollar site retrieved 7 July 2007. ↑ "Nathan Bedford Forrest, Slave Trader," Domestic Slave Trade Nathan Bedford Forrest, Slave Trader retrieved 7th July 2007. ↑ Cheryl Hiers. "New Statue of Nathan Bedford Forrest Raises Old Controversy in Nashville," Blue Shoe Nashville Travel Guide New Statue of Nathan Bedford Forrest Raises Old Controversy in Nashville retrieved 7 July 2007. ↑ Curt Anders, Fighting Confederates. (New York: G.P. Putnam's Sons, 1968), 120. ↑ Andrew Nelson Lytle, Bedford Forrest and His Critter Company (J. S. Sanders & Co., 1984). ↑ Bruce Catton, Civil War. (New York: American Heritage Press, 1971), 160. ↑ Scott Barker, "Nathan Forrest: Still confounding, controversial," Knoxville News Sentinel, February 19, 2006. Anders, Curt. Fighting Confederates. New York: G.P. Putnam's Sons, 1968. Bearss, Edwin C. Unpublished remarks to Gettysburg College Civil War Institute, July 1, 2005. Carney, Court. "The Contested Image of Nathan Bedford Forrest." Journal of Southern History 87, no.3 (2001): 601+. Harcourt, Edward John. "Who Were the Pale Faces? New Perspectives on the Tennessee Ku Klux." Civil War History 51, no.1 (2005): 23+. Henry, Robert Selph. First with the Most. Indianapolis: Bobbs Merrill Co., 1944. Tap, Bruce. "These Devils are Not Fit to Live on God's Earth': War Crimes and the Committee on the Conduct of the War, 1864-1865." Civil War History. 42, (June 1996): 116-32. Williams, Edward F. Fustest with the mostest: the military career of Tennessee's greatest Confederate, Lt. Gen. Nathan Bedford Forrest. Memphis: Southern Books, 1969. General Forrest Obituary, "Death of Gen. Forrest", New York Times, October 30, 1877. History of "Nathan Bedford Forrest"
This page was last modified on 8 November 2018, at 17:23.